Busy day at Sharp Park! Father-son Jon and Wyatt McGovern discuss strategy on the first tee, while in the background Wing Lai, Don Chinn, Clifford Lai, and Weyland Lum (L-R) celebrate a birdie putt on the 18th green, at the recent Alister MacKenzie Tournament to Save Sharp Park. PACIFICA, CA. After years of political, legal, and bureaucratic delay, work began here this week at the historic Sharp Park Golf Course on the first stage of a combined habitat recovery and golf renovation project intended to safeguard endangered frogs and snakes, while renovating the landmark Alister MacKenzie-designed public links. On June 1, the California Coastal Commission issued a coastal development permit to San Francisco for the Sharp Park Pump House Project, to dredge cattails from wetland areas, construct a new frog pond south of the golf course, and move a small section of cart path out of a wetland bordering the 14th Hole. High Five! 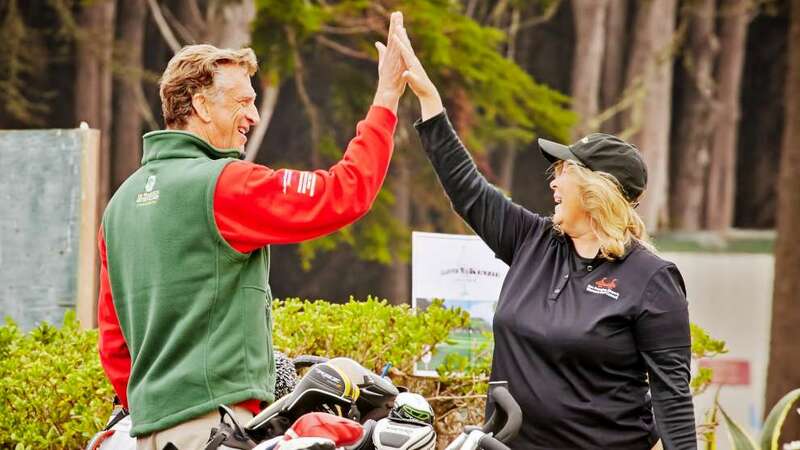 Alister MacKenzie Foundation founder Nick Zwick celebrates with Lyn Nelson, Chair of the San Francisco Mayor’s Women’s Golf Council. Sharp Park’s moderate greens fees notwithstanding, the course is ranked among the Top 50 Municipal Courses in the Country. It is home for high school, women’s, minority, and seniors golfing societies, and in 1955 hosted the inaugural tournament of the Western States Golf Association, one of the oldest and largest African-American golfing societies in the U.S. Coordinated local-state-federal planning for habitat and golf restoration at Sharp Park began with the 1992 “Laguna Salada Resource Enhancement Plan,” commissioned and financed by the California Coastal Conservancy, which prescribed dredging the lagoons and other measures to recover endangered species habitat at Sharp Park, while preserving the historic golf course. That study was followed by construction of the $12 million Pacifica Recycled Water Project, jointly financed by Pacifica, San Francisco, and the Federal Government, which brought recycled water from Pacifica’s Calera Creek Water Treatment Plant to irrigate the golf course. The pumps, pipelines, and storage tank were completed in 2012, and recycled irrigation water began flowing to the course in Fall, 2014. Remaining to do at Sharp Park is more habitat recovery work, together with restoration of the golf course itself -- one of the few public courses built by legendary golf architect Alister MacKenzie, who designed many of the world’s acknowledged greatest courses, including Augusta National, home of the annual Masters Tournament, and the Cypress Point Club on the Monterey Peninsula. Plans for that restoration and recovery work are currently undergoing environmental review in the San Francisco Planning Department. 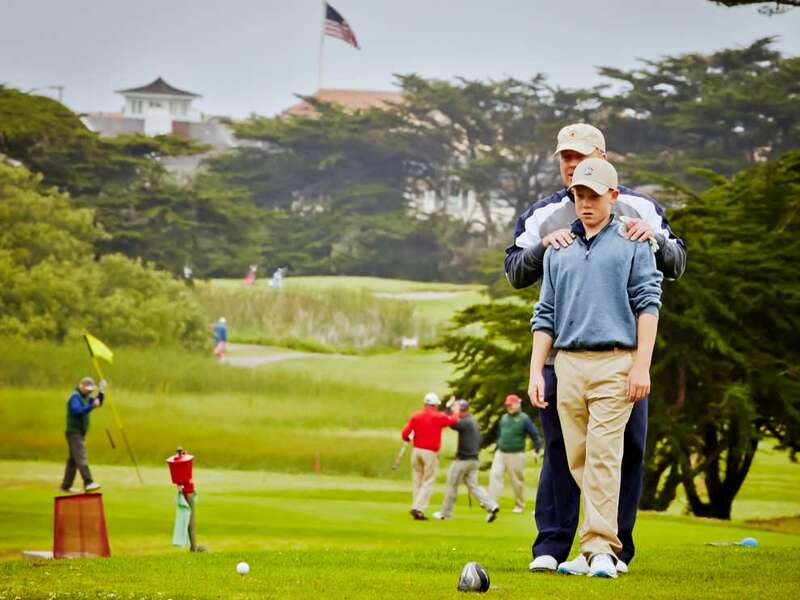 San Francisco Public Golf Alliance and the Alister MacKenzie Foundation are working together to raise philanthropic funds for the golf course restoration.